Hedge fund magnate Robert Miller has a motto, “A business must project success.” Richard Gere, who just gets better with age, plays the part in Nicholas Jarecki’s directorial debut of Arbitrage, a story about how complicated being a type A patriarch can become. Besides tackling the trendy slant on recent Wall Street shenanigans, Arbitrage returns to age-old ironies of the devout, loving family man who will do anything to provide for and secure the future of his wife and family. Tony Soprano would be the paragon of such a man. Robert Miller is no Tony Soprano, however. It’s a first class life for this billionaire empire manager in that bigger town across the river from Jersey. His wife Ellen (Susan Sarandon), is up to her ears in charities. Their daughter, Brooke (Brit Marling), works for dad at the firm. She’s forthright and thorough, and looks like the person who’ll be running the show when Robert hangs it up. Laetitia Casta as Julie Cote with Richard Gere as Robert Miller. There is also Julie (Laetitia Casta), who plays a French painter. Robert has invested in her because she has great taste and can spot works of art that are sure to rise in price so Robert can make even more money buying and selling. Julie and Robert are also lovers. James Mayfield (Graydon Carter) heads another investment business, and seems to be dragging his feet about signing the contract to buy most of Miller’s concern. In private, Robert appears worried about the deal stalling out. Meanwhile, on another set of books, Miller’s company actually has nary a paddle up Money Creek. Not a good thing for a man trying to sell his company while keeping that important information from his prospective buyer. As Miller says, “A business must project success,” even when it’s not. At about signing time when Robert and Julie are motoring upstate to a private hideaway, Miller dozes off while driving through the dark night. Julie’s Mercedes-Benz careens off an abutment and flips several times. Julie is killed. Robert is injured but not to the degree that he can’t get away from the car before it bursts into flames with his companion’s body still inside. On a pay phone, Robert makes a collect call to Jimmy (Nate Parker), to come get him; no cells phones and stuff. Robert took care of some bills for Jimmy, so Jimmy owes Robert, although he is really trying to get his act together again after some difficulties with the law a few years back. Tim Roth as Detective Michael Bryer. It’s only a brief lapse of time before Detective Bryer (Tim Roth) of the NYPD shows up at Robert’s office to ask the investment guru about his relationship with Julie, since the police are sure that she wasn’t alone in her car or even driving it at the time of the mishap. This is not a good time for Robert to get negative press regarding the death of a lovely young female painter who was burned beyond recognition in an upstate auto accident. The sale of his covertly languishing business might be put in jeopardy. Arbitrage omits essential information until it wants to let you know what that information is. It makes for a mature and curiously twisty kind of movie experience. Britt Marling as Brooke Miller. For me, the film was also a pleasant musical experience. Former Red Hot Chili Peppers drummer Cliff Martinez did the smart, well-positioned score. It fits and is most tasteful. There’s even a swath of lovely music under the closing credits with pianist Robi Botes playing, “My Foolish Heart,” much like the late jazz piano man, Bill Evans, probably the coolest and best damned balladeer jazz keyboardist to ever walk the planet. Director Jarecki, who also wrote the script, doesn’t make Arbitrage overtly political or grossly critical of its billionaire bad guy. Gere’s character is not a cardboard figure just to throw darts at. Robert has numerous facets to examine. And as you’ll find later, his wife does as well. 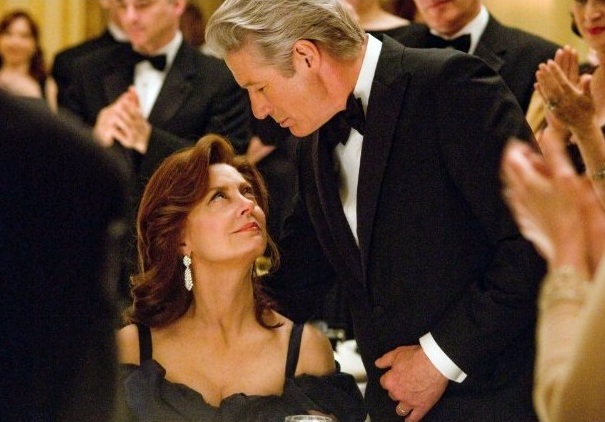 If you watch “Damages” or “Rubicon,” you’ll also find moments of delayed exposition. Such stuff can keep one awake.